Mezcal, the Mexican spirit distilled from agave, is popping up everywhere. Some of the Bay Area's top mixologists are using it; last year Mosto opened up as part of Tacolicious' move into the Mission and features an extensive tequila and mezcal selection, while bars like Emeryville's Prizefighter and the Western Addition's Nopalito each have fantastic selections. A few months ago Susan Coss and I decided to launch Mezcalistas, a blog devoted to artisanal mezcal. 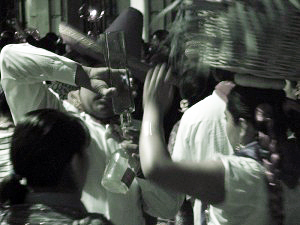 Susan had spent a considerable amount of time in Oaxaca and had an early conversion experience to mezcal. Mine came rather recently but I haven't stopped enjoying it since. As part of our general mission to explain and cover the world of artisanal mezcal we've held a number of informal tastings but this July 25th we're taking the next step and throwing a public tasting with San Francisco's The Bold Italic. At the event, we'll taste different types of mezcal, talk about how they're made and explain what you're tasting. We'll also be serving a cocktail to demonstrate how you can use it as a mixer and appetizers that will highlight its versatility as a food companion. In Mexico, many people drink mezcal or its cousin tequila with a meal, so food pairing is a particularly important part of the conversation. 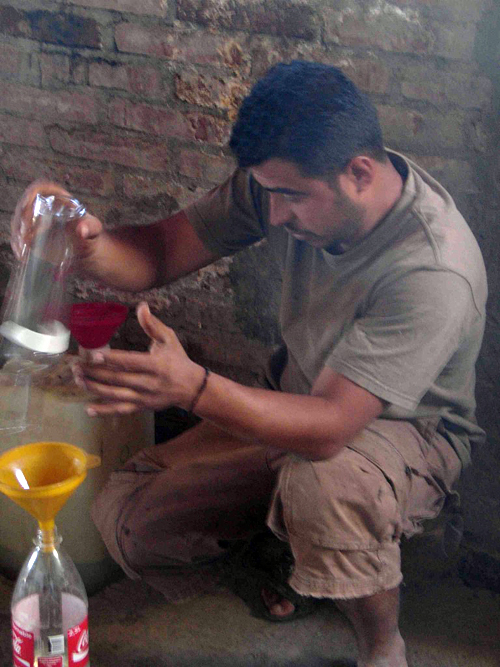 Now, to whet your whistle, here's a primer on the wonderful world of mezcal. 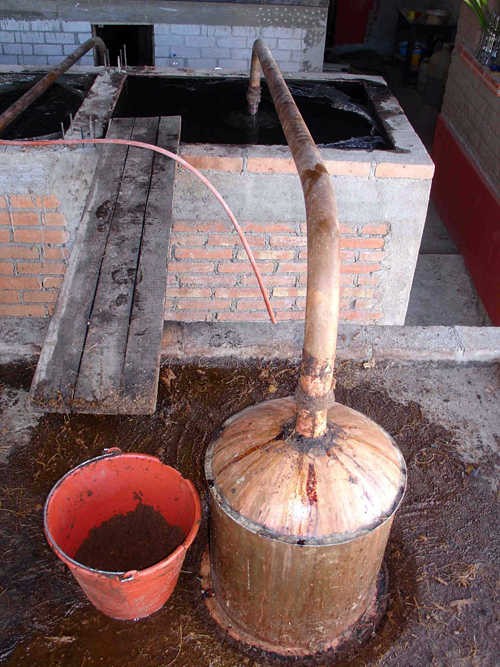 Mezcal is the distillate of fermented agave juice. 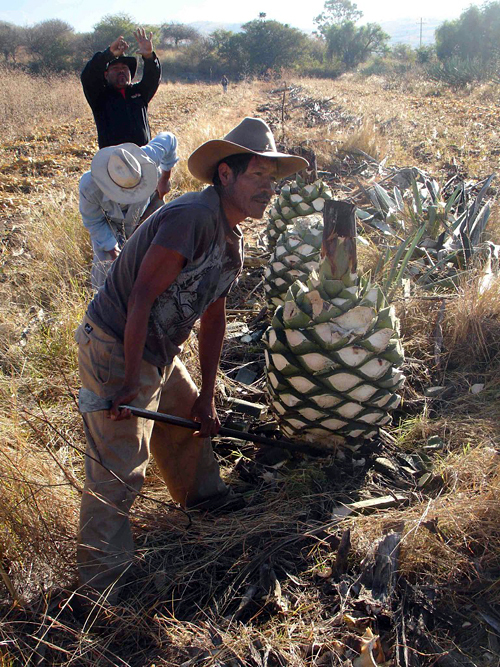 Mezcal producers cut the leaves off agave plants, harvest the piná or "pineapple" heart of the agave, cook it underground, then ferment and distill it into a spirit that varies widely in alcoholic content but is usually about 40 percent and occasionally higher. Conventional wisdom in Mexico is that a mezcal needs to be at least 45 percent. You can take a look at the photo gallery we posted to get a sense for how basic this process is. 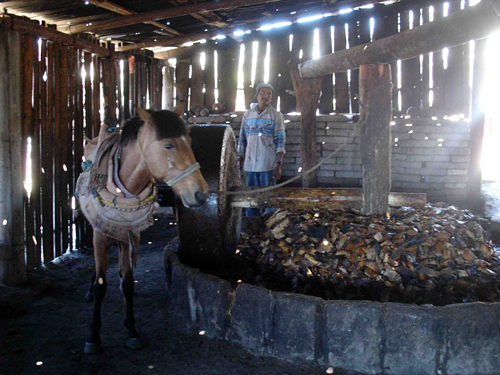 Contrary to all the glistening stainless steel production facilities that usually produce culinary goods, palenqueros (traditional mezcal makers) are out there chopping agave by hand, building fires in pits to roast them and pushing mules around in a circle to grind the pinás into a fermentable pulp. The variety of flavors in different mezcals, which can be distilled from various types of domesticated or wild agave, is one of the pleasures of the drink. Generally, what they share is a degree of smokiness and an agave flavor. How much and how it's highlighted depends on the maker's style, which can roughly be grouped into three strands. First, there's the very traditional mezcal, which fills the mouth with a viscous body and a forthright agave flavor that includes herbal and vegetal notes. Another traditional form puts alcohol in the spotlight with a higher degree of smoke. The third is the popular, contemporary form, generally lower in alcohol, lighter in body and lighter on the smokiness. Aside from taste, mezcals are severely limited in quantity since it takes so long for agave plants to grow (5-7 years for the domesticated espadin, as long as 12-17 years for the wild varieties) and because much of the production is still done in small batches. Nor are the agaves completely domesticated like the blue agave used for tequila, so source material is always an issue. Palenqueros are frequently inheritors of long family traditions. Each palenquero brings his own idea to the mix: espadin, silvestres, blends, high alcohol, heavy body, viscous, flavor variation. 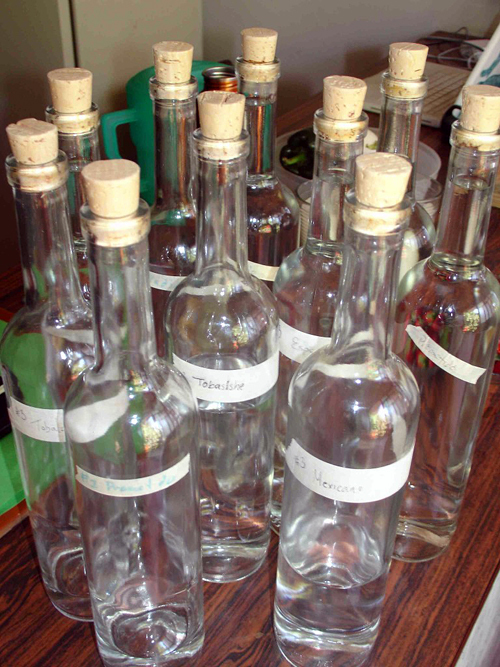 Like many traditional distillates, palenqueros add things to their products. The most notable is a style called pechuga, where they add a turkey or chicken breast, sometimes even a rabbit, to the distillation process. It sounds almost impossible, but the meat adds an ethereal tone to these mezcals. Try one and you may never look back even if your wallet complains: Pechugas are extremely limited in production and therefore quite expensive. Then there are the fruit, herb and nut infused varieties. We have yet to see one of these commercially available in the U.S. but should you see one in Mexico give it a try. Tequila and mezcal are frequently mentioned in the same breath. Technically, any agave distillate is a mezcal, so mezcal drinkers love to point out that tequila is just another mezcal. Tequila drinkers love to point out that while all tequilas are mezcals, not all mezcals are tequilas. The main difference is that tequila’s production is very well-defined while mezcal allows much more flexibility to its makers. In the wine world it’s the difference between a well-defined appellation like Cotes du Rhone and an amorphous one like Vin du Pays. Tequila has to be made almost entirely of a single type of agave, blue agave aka Agave tequiliana Weber, produced in a very limited geographical area dominated by the state of Jalisco in Western Mexico, and is roasted above ground in steam ovens or autoclaves. Mezcal can be made from 27 types of agave though generally from the Espadin. It is produced in seven states centered in Oaxaca and roasted however the maker wants -- generally underground. 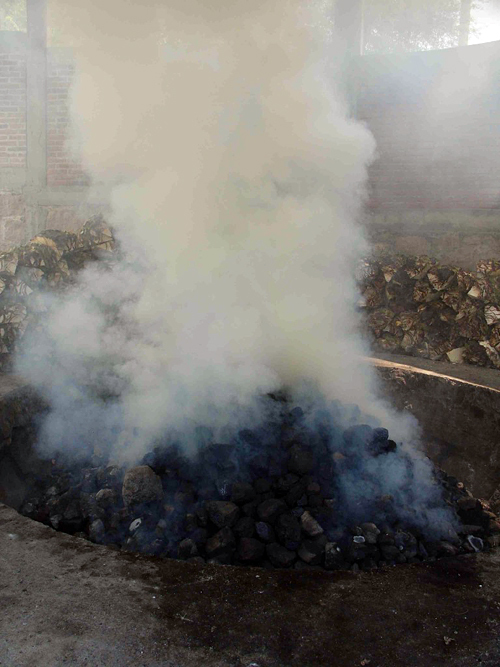 The way tequila and mezcals are roasted produces one of the major taste differences. Mezcals tend to pick up a distinct smoky flavor from their direct contact with burning wood while tequilas rarely have a hint of it. The fact that mezcal can be made from so many varieties of agave means that you can find single-agave mezcals of wildly different taste sensations, especially the wild or silvestres agaves which contribute a veritable constellation of flavors. There's your introduction to mezcal. For more information and to experience mezcal come to our tasting and follow our blog. We're planning to have many more tastings and we aim to keep you up-to-date on the world of mezcal.